In case you missed it, we’ve been hard at work revealing RESAAS' 2016 Real Estate Rockstars. To date, we’ve shared the noms of winners for branding, real estate websites, social media, real estate coach, and most innovative brokerage. Yesterday we announced the nominees and winners for the best real estate video. We get to read through tons of blogs. We also get to collaborate with some great real estate agents and bloggers in the industry. Unfortunately, this has only made it harder for us to select just a few real estate blogs to add to this short list of nominees. Alas, we bit the bullet and selected a few of the best real estate blogs I came across in 2016. But before we go ahead and reveal those, let us lay the land for how we based the judging - the criteria for selection. Setting the criteria for judging was one of the hardest parts of this. Trying to determine what should define a “great blog” isn’t an easy job or something that I took lightly. Anyone can write a blog but not everyone can know who their audience is and tailor their blog posts to their niche. The quality of the blogs should speak to this. Not only that, but they should just be well written. "TLDR" (Too Long Didn’t Read) blogs are a no-no. If you couldn’t read through the whole thing then nobody will. An essential quality of a top blogger is the ability to promote their content. Content won't do much good if it doesn't reach a maximum audience who will share and engage with it. Does the blogger promote their content as best they can? Is the content available to the masses? Is the blog being shared among social circles? A good blog that is liked amongst the blogger’s audience should yield good engagement. Whether it's likes, shares, reports or comments, the blogs should have any or all of these boxes checked off. Does the blog include social share icons to increase engagement? Do the blogs have comments and discussion among the blogger’s readers? Xavier De Buck has made quite a name for himself on the LinkedIn and Facebook circuit, as he hustles to promote his blogs very efficiently and well. What makes Xavier so impressive is that he is an international agent, based out of South Africa, though through his blogs, he's been noticed by North American REALTORS®. It's due to this that Xavier deserves a nomination for one of the industry's best blogs. A first time nominee for RESAAS' Real Estate Rockstars, Luke Skar is the a web developer and content strategist. It's his expertise in writing and promoting perfectly written real estate content that's made his blog shareable amongst a slew of real estate influencers. Ryan Fitzgerald's blogs are widespread across the internet, offering informative information for new REALTORS® and potential clients/leads. Another great aspect of Ryan's blog is the mix of text, relevant imagery and infographics. Arguably one of the most active REALTORS® blogging daily, Bill Gassett delivers valuable content, which is often shared amongst his peers as well as homebuyers and sellers alike. Due to Bill's relentless promotion of his blog through various social media channels, Bill's blogs are linked regularly and used as a reference for many other real estate bloggers thus increasing his blog's reach. Kyle Hiscock has become quite the household name (no pun intended) amongst the real estate community. 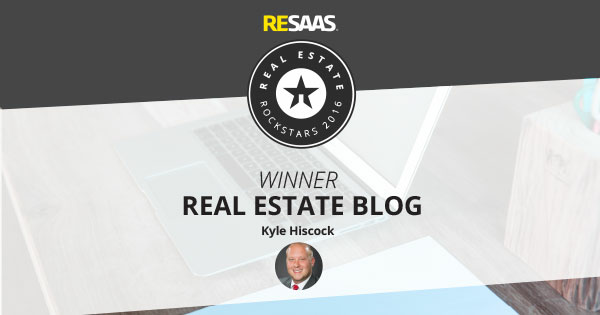 Kyle has been in the real estate industry for many years as a result his blog is a go-to resource for new REALTORS® as well as bloggers and sellers/home buyers. Kyle's blogs are chock-full of knowledge information on various topics around real estate. You can regularly find Kyle's blogs being promoted by himself and other featured agents within his blog through various social channels. Download RESAAS' 2016 Real Estate Rockstars booklet to see the full list of nominees!